Even though I have been slack with the blog I have been superbusy everywhere else. I did the Canberra Handmade market which was 'just nuts'. So much fun and crazy busy. Again, met loads of lovely people. Both customers and other stall holders. 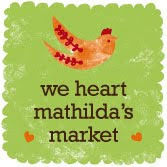 The next day I had Mathilda's in Lane Cove. Even though it wasn't as busy as last year's Christmas market, it was still a great day. I am going to be at Bondi tomorrow so hopefully we will have great weather as it is only two weeks until Christmas. I am hoping that people will favour handmade over the crazy busy malls.